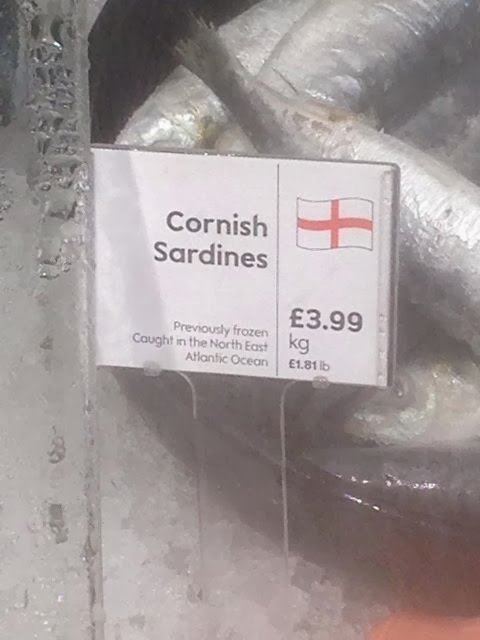 There's been image circulating social media for a few weeks now, of Cornish sardines (pilchards) displayed with an English flag, along with the caption "spot the mistake". It's something I'd not noticed until this week, so I asked them on twitter why it wasn't a Cornish flag (as did many others on their facebook page and twitter). The same stock answer came back for ease of identification an English flag is used, any questioning of this was answered with a stony silence. I even asked their twitter operator if they knew what a Cornish flag looked like, no reply. The customer is always right unless their Cornish? So I sought a more considered response and some dialogue, so I emailed their ceo. Explaining Cornish pride in our flag and our food. I also pointed out the significance of the quality of Cornish produce and that Waitrose should take pride in that. I pointed out the trend toward labelling the origin of food and it's food miles. All good arguments, I believe for displaying Cornish food as Cornish. Anyway here's the reply I received to my email a few days ago, it's a very token response and didn't address any of my points. Any thoughts to what my response should be? Thank you for your patience while I looked into this matter. I’ve contacted Jeremy Langley, our fish buyer with your enquiry. He’s advised that the use of national flags was introduced to help our customers to quickly identify UK produced fish and shellfish. We decided to use national rather than the regional flags as these are more easily recognised by our Customers. Cornwall is recognised as a county of England within the United Kingdom and therefore the use of the English flag to denote Cornish sourced product is correct. We appreciate your thoughts on this matter but I’m afraid at this stage we haven’t got any plans to change our current labelling of our fish. We do hope despite this, we can look forward to seeing you in our stores again soon. "We decided to use national rather than the regional flags as these are more easily recognised by our Customers. Cornwall is recognised as a county of England within the United Kingdom and therefore the use of the English flag to denote Cornish sourced product is correct." I'd just make up a Cornish flag sticker of appropriate size to the English flag and carefully place it over the English one. It's a good work around! like your thinking. So what are we going to do? Walk away grumbling or at least try and hit them where it hurts? This calls for a concerted boycott campaign with some direct action if needed! The start could be a blog, eventually leading into a more general - Say Cornwall / Say Cornish - campaign aimed at all retailers in the Duchy. Sainsburys slapping South West of England all over their stories is another target. This is blatant English nationalism and if we tolerate it it'll be just another proof that Cornwall unlike Scotland or Wales can be walked all over. Indeed that is the wider aspect. I also included in my email (see below) Cornwall food and drink. Trying to highlight to them the importance of Cornish food being correctly labeled as Cornish. As for a wider campaign, we'll see how this pans out first. Does it even matter? They are selling a product from Cornwall and as Cornwall in an English county this is totally acceptable. I bet the producer is very happy. It does matter to me and to other people. The more we can highlight the quality of fresh Cornish produce by putting Cornish symbols like the flag by it. The more we can build that brand and the more happy Cornish producers we can have. This is one of the things I'm investigating. To carry the label Cornish Sardines they need to be exactly the opposite of what you describe. might want to point out to them that their friends the Duchy stated in a court of law that both the government and dominion of the territory of Cornwall lays with the Duchy, not the English/British crown. Good point, why don't you email them and explain it to them. The more voices and different arguments the better. Caught in the North East Atlantic, hardly Cornish, so remove the word Cornish from the description. You lot can then knock another nail into Cornish industry and sabotage local jobs. Sorry I'm a little confused, first you explain they're not Cornish then worry that Cornish jobs will be lost. Which is it? talk about a bloody joke! I was looking at your pathetic attempts to get the flag of our country, England,removed from these sardines, and replaced with a Cornish flag which no one would recognise. That would be putting a nail in the coffin of Cornish jobs. 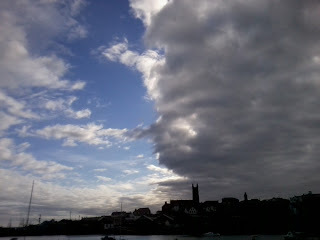 Can you not take the hint that your rabid "nationalism" is not wanted here in Penzance boy? Like it or not, just as I allow you the freedom to troll my blog, I also have the freedom to express my opinion. For the things I don't like about society fortunately we do live in a state where freedom of speech is maintained. You may disagree with me you may think I lack legitimacy that's your right. Could you please explain how having a Cornish flag on Cornish Sardines "would be putting a nail in the coffin of Cornish jobs"? I'm intrigued by your hyperbole. Its not just the fish either. I went in to have a little looky for myself and its also the cheeses. But I feel all supermarkets should be boycotted. Use your local butchers and grocers. I feel I'm really supporting my community and it all taste that much better. Plus get to know your butcher and they usually chuck you a good deal. I only use the supermarkets for a few of my household products. Ugh might've known they'd be doing it with other Cornish produce. +1 on shopping local, much better solution. Apologies to everyone for being tardy in replying. As an update I've researched the PGI status and I'm seeking clarification from the relevant authorities on the validity of Cornish sardines being caught in the Atlantic. The "border" of that Ocean is at Land's End basically and considering Sardines or Pilchards are caught primarily around Mevagissey and Mount's Bay that doesn't count. I'll reblog when I have some form of response and intend to contact Waitrose again when I have clarification, to strengthen the argument around pronouncing Cornwall as the origin of the fish. The PGI basically defines Cornish Sardines as caught by boats working from Cornish harbours and caught within 6 miles of shore. I believe the majority of Waitrose's catch comes from the Newlyn registered but Mevagissey based Asthore. If this is so they definitely are Cornish and more than fit into the PGI's requirements. All views written on this blog are my own and are not official representations of any; council, body, charity, or any other organisation I am involved in. Unless otherwise clearly stated. © 2018 Robert Simmons. Simple theme. Powered by Blogger.